Josie's Bike Life: Yes I Can- Embrace a New Challenge. I walked into Grand Bluff Running, feeling timid and completely out of my element. I'll blame Spring Fever and this unpredictable winter we've been experiencing here in Northeast Iowa. I had been longing for some time outdoors yet the mountain bike trails have been either ice-covered or too soft for riding. Gravel riding wouldn't be much better, and I am not able to do much for a gravel ride prior to heading off to work. The paved trail still had ice (and then flooding from the thaw), so riding that wasn't an option, either. I look at the concept of running the same way as I looked at riding my bike in my younger years- my greatest enemy. Granted, as a kid I did learn to ride a bike- I could ride it around the yard and not feel like my lungs were going to burst. Running? I avoided that even more. I hated how it made me feel both physically and mentally. The mile run in school was the most dreaded time of year for me. One year I know the P.E. teacher cut a lap for me out of sympathy. Why make everyone wait for someone who was so slow? 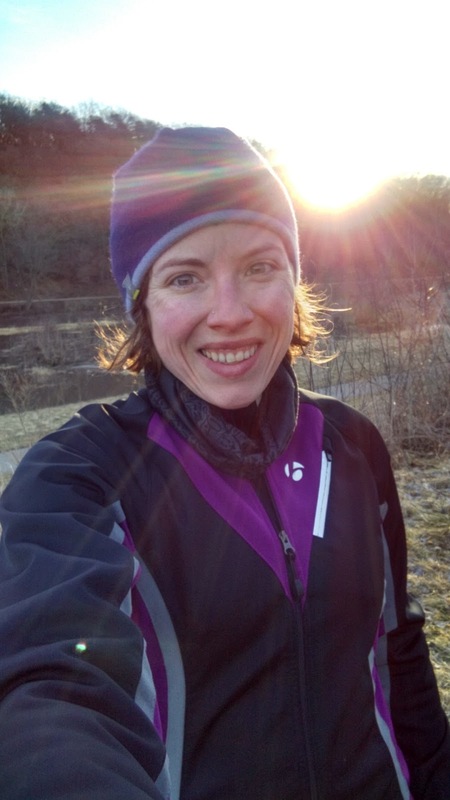 Running, like biking, gave me a sense of shame because of my lack of ability. Later on, probably in the 2008/2009 era of my life, I gave running another go. However, where I had been living wasn't the most scenic of towns and I struggled to feel incognito in my attempts at fitness. I didn't have a route that I felt comfortable on and I felt vulnerable to the gazes of folks either on foot or in their vehicles. When I moved to Decorah I thought that I would give it another shot and managed to make my way to the Dug Road portion of the Trout Run Trail to try out my jogging legs. Full disclosure that I was a light smoker at the time, but I found that I could barely jog for any distance. I had a hard time breathing, I was around so many other pedestrians, and I felt frustrated with my lack of stamina. I gave it a couple attempts and it didn't take long for me to deem it "impossible." Why after all these years, did I decide that I wanted to conquer a physical activity that gave me so much insecurity? Honestly? I'm not sure. I figured that with what I've done to improve my health that I would have to have a better shot at it. I wanted to do it right- go to a store, get properly fitted for shoes, and give myself time to adapt. I felt it had to go better than before, and I wouldn't allow myself to give up easily. Walking into Grand Bluff Running for me is probably similar to how folks feel when they walk into Decorah Bicycles. Granted, our inventory outmatches theirs in terms of what we have on the floor- it was enough to make me go "Woah..."
A wall of shoes that would be a mystery to me, clothing options to look over, and various other accessories that I might find myself wanting. I knew I'd come out with a pair of shoes, 2 pairs of shorts, and one pair of lightweight tights. I anticipated running 1-2 days a week at most during my biking season, so no need for "all the things." I talked with the sales associate who was more than happy to help me figure out the ins and outs of what I needed to start my journey. I was given a pair of shoes to try on and made my way to the treadmill to have my gait analyzed. I was pleased to learn there wasn't anything too much about my stride to worry about in terms of pronation. Hooray! No inserts for me. Now the hard part was to figure out what type of shoe would work best for my foot- something with minimal cushion or something with some cushion. I absolutely did not want full cushion, because I felt it would be too much. 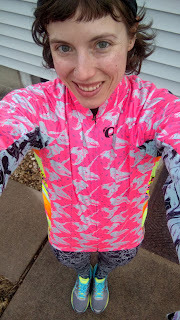 My goal was to take on trail running and like with riding, I want to feel a little something under me- I dislike being "desensitized." I walked out with 2 pairs of Asics in colors that I actually liked, one with Goretex for wet/cold days and the other would be my "summer" shoe. 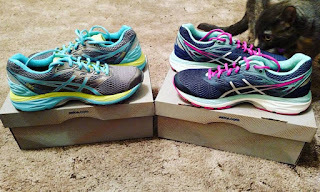 They were in the middle of the spectrum for cushion, which with test-jogs I found more comfortable and supportive for my finicky feet. Then I had to figure out what type of shorts to go with- baggy or snug? I opted to go for a light, baggy style short as when it's hot, I absolutely hate being hot. I went with tights that were black with a little bit of pattern on them, because I have tendency to wear black cycling shorts a lot. Live it up a little! So I came home with two pairs colorful shoes that the Josie of years prior would have buyer's remorse over due to price- and a commitment to myself that I would use these shoes enough to warrant the money spent. Now the challenge was finding time to go for my first jog, which was something that intimidated me. 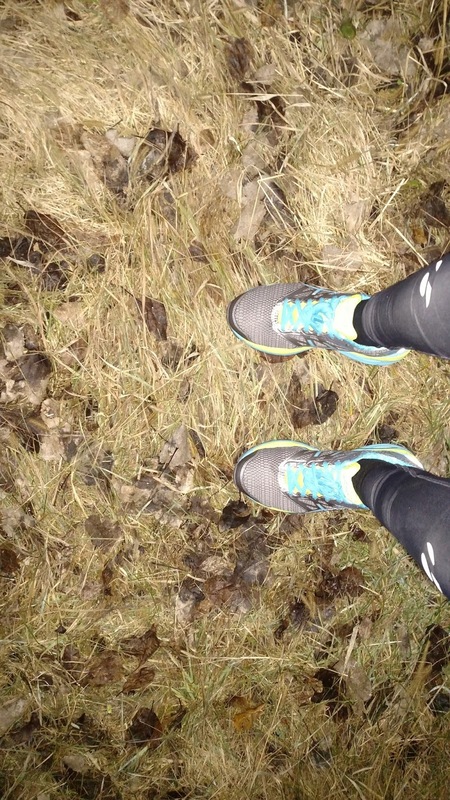 My first jog happened on a Friday evening, under the cloak of darkness. I made my way from my house to the dike that runs parallel with the Trout Run Trail. I thoroughly questioned my sanity for going out in the dark without a light, hoping that I wouldn't somehow find a gopher hole. I managed to jog from the house, to the end of my route, and back without stopping for more than a photo for proof and a little bit of stretching. My legs the next day felt like they were on fire. The thought of running anytime soon was not thrilling to me- but I went out again a few days later to find that it actually seemed to help. Then another jog found me feeling more confident with myself being able to handle this whole "running thing." As of writing this, I've gone on a total of 4 jogs- minimal, but enough for me to feel like that this is a very real probability of my being able to get better at another thing that intimidated the crap out of me. I'm taking the reigns again, choosing to not allow a physical activity to get the better of me. Using another activity to hopefully improve myself on the bike, plus, it will allow me some necessary time off the bike to keep chronic pain flair-ups at bay. Hopefully I can keep burnout at bay, too! For folks looking to get involved with a new activity, I feel you. This isn't my first rodeo- I have been thru the same, painful process of inadequacy and uncertainty when I bought my first bike. Going into the experience as a "new to me" person, I would say was helpful for me to remember what it's like to be on the other side of the equation. In the bike shop, I'm perceived as an "expert" when I truly feel I'm a far cry from that. I'm a woman who loves biking who just so happens to want other people to love biking, too. I started from the ground in terms of bikes and worked my way up, in a short time I learned the stark differences between budget bikes vs. spending a little more to get a bike you can grow with. I knew based on my experience that I wouldn't skimp on shoes. Sure, you can go anywhere and buy a pair of shoes to run in, but does that mean they are actually right for you? I was on the receiving line of respect for getting into a sport that intimidated me. Time and care was taken to ensure I had the best experience possible with learning the ins and outs of fitting. No question was perceived as "dumb." I got to experience a fellow woman who loved her sport, being able to help another woman get started. It was inspiring on many levels. I also loved the feeling that I was supporting another local, brick and mortar store. Maybe this is the year you decide that you want to get into another form of cycling. Maybe this is the year you decide to find your #bikelife for the very first time. Possibly, you're like me looking to find something else to immerse yourself with so you can keep improving and enjoying a sport you already love. Either way- go into it with an open mind. Allow yourself to be vulnerable- ask the questions on your mind and communicate what you hope to do. If you are with someone who truly knows their stuff, they will listen to you. They will give you honest feedback. Interact with someone who cares about your experience- be willing to explore options. time to get properly set up with whatever it is you want to do. If you cut corners, sometimes you end up setting yourself up for an experience that will not be beneficial to you or your growth in the sport. Seek knowledge, gain information, and make the best investment on your behalf that you can. No one likes the thought of putting money down on a bike they will outgrow in a season- it's the same as putting money into a pair of shoes that really aren't made for running. As nervous as it made me, I learned that it's fun to embrace a new challenge! What will your next adventure be?